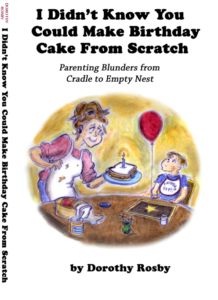 Today we are thrilled to excerpt a chapter from I Didn’t Know You Could Make Birthday Cake From Scratch: Parental Blunders from Cradle to Empty Nest by Dorothy Rosby. Put the Gun Down and Come Eat Your Breakfast! I’m awakened by five young toughs carrying weapons. I’m groggy and confused but unafraid—maybe because they’re rubbing their eyes and wearing their jammies. Besides, there aren’t enough weapons to go around, so one of them is carrying a clipboard. It’s the morning after a birthday sleepover and the toys and games remind me: boy play is goofy. Having been a girl myself, I can say without a doubt that girl play is also goofy—or at least it was when I was playing. It’s just goofy in different ways. Even boy toys are weird. While many toys marketed to girls are stupid and sappy, many toys marketed to boys are stupid and creepy, especially the dolls. And yes, boys have dolls; they just don’t call them dolls. And if you know what’s good for you, you won’t call them dolls either. You’ll call them “action figures.” But they’re dolls nonetheless; they’re just ugly dolls. Girls’ dolls talk. Boys’ dolls make strange beeping noises. Girls’ dolls wear gobs of makeup and have retractable hair. Boys’ dolls wear shields and have retractable heads. And then there’s the weaponry. It’s almost a cliché that if parents swear off toy weapons, their sons will shoot with bananas. Or tennis shoes. Or toothbrushes. After a while you hardly notice that cuddled up next to your son’s Cookie Monster is a plastic grenade and a triple action machine gun. Boys take up the entire house. If there’s a war going on, as there often is, there will be collateral damage in every room. I’ve even found army men in my purse, which can be embarrassing at the checkout counter. Boys have a great sense of fairness—especially when they think they’re being treated unfairly. And they generally play by the rules, which is harder than it sounds when you consider how often the rules change. Parenting experts would agree that intervening in such a debate is unwise. Children must be allowed to work out their own disagreements in order to become mature adults who can cooperatively settle disagreements about toxic laser beams and aluminum robots. You can buy I Didn’t Know You Could Make Birthday Cake from Scratch on Amazon.